Slay In Your Lane: The Black Girl Bible. 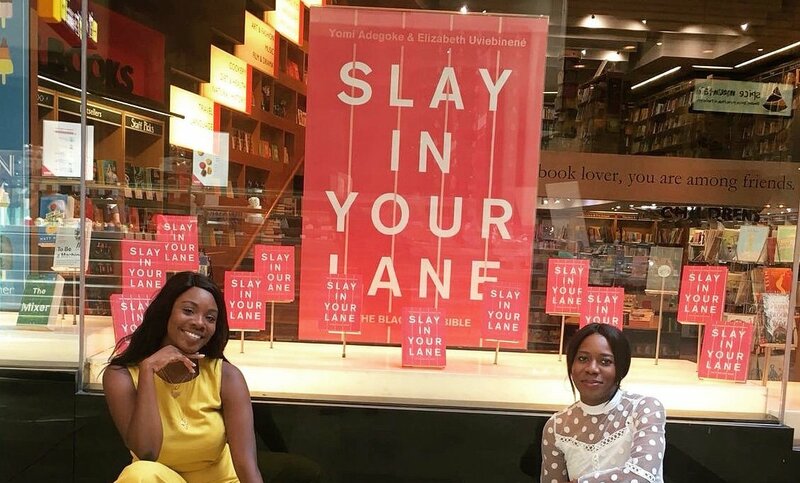 In our ongoing celebration of UK Black History Month (the other day, we told you about the incredible Diane Modahl MBE), we’re now going to look at Slay In Your Lane: The Black Girl Bible, a new book by Yomi Adegoke and Elizabeth Uviebinené. Earlier this month, Adegoke and Uviebinené visited the Manchester Literature Festival to discuss the book, which is a timely and expertly researched exploration into what it means to be a black woman in the UK. We had such a great time at @mcrlitfest in conversation with amazing #SIYL interviewee @gemagain. Thank you Manchester for having us! ???? As the title suggests, the book is part-advice, part-mini encyclopedia that gives readers the tools to help them navigate life, whether it’s work, relationships or school. Uviebinené had the idea for Slay In Your Lane when she noticed how self-help books never seemed to relate to people like her. There are books with female role models that discuss things like women in the workplace, health and money, but almost none of them deal with black women. With the help of childhood friend Adegoke, a journalist, the pair spent all of their free time for well over a year writing and researching the book. They interviewed 39 accomplished black women; including Laura Mvula, June Sarpong, Denise Lewis, Jamelia, Margaret Busby, Malorie Blackman and Estelle, about success and the obstacles they’ve encountered along the way; and delved into their own stories – and a lot of data – to reveal how much harder a journey black people, especially black women, face in school, university and the workplace. ?THIS IS NOT A DRILL? SLAY IN YOUR LANE is now available on @asos ? ?! In celebration, we'll be taking over their Instagram stories on the 26th of September, so make sure you tune in! Ultimately, the book was written to empower black women to carve out a place in the world and achieve their goals. However, everyone and anyone should read it. By learning about the struggles other groups face, we can not only respect their stories, but begin to redress the balance between different races, genders and backgrounds. Be sure to follow the Slay In Your Lane Instagram. For more information about the Manchester Literature Festival, check out the website.